Cream butter, 3/4 cup sugar and vanilla in mixer bowl. Add 3 eggs, beating well. Combine flour, baking powder and baking soda. Add dry ingredients to butter mixture alternately with sour cream. Combine pumpkin, beaten egg, 1/3 cup sugar and pie spice. Cut 1 cup firmly packed brown sugar, 1/3 cup butter and 2 teaspoons cinnamon together until blended. Stir in 1 cup chopped nuts. Spoon half of batter into 13 x 9 x 2-inch baking dish; spread to corners. Sprinkle half of Streusel over batter. Spread pumpkin mixture over Streusel. Carefully spread remaining batter over pumpkin mixture. Sprinkle remaining Streusel over top. Bake in slow oven (325 degrees) 50 to 60 minutes or until toothpick inserted in center comes out clean. This classic recipe for a perfect holiday brunch is from a 1987 advertisement for Libby's Solid Pack Pumpkin. 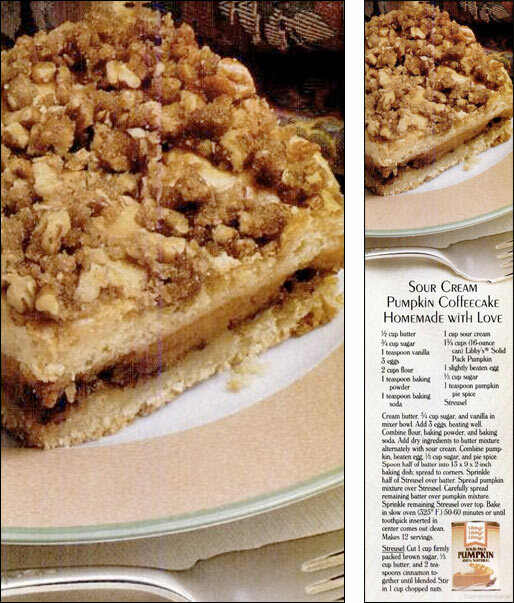 According to the ad, this coffee cake is homemade with love. Recipe number 2944. Submitted 10/22/2010.